Though I start working on my sermons early in the week, the final work inevitably happens on Saturday. I wish that my Saturday work involved just a minor tweak or two, but the truth is that on Saturday morning I’m still tinkering with the introduction or the conclusion or some other thing. Every preacher apparently has a different routine. Here’s mine. After a fair amount of preparation through the week, I finally sit down to write it out early on Friday morning – applying “seat of pants to seat of chair,” as William Barclay once described the writing process. I get to the church early and often stop at the 7-Eleven for the largest cup of coffee they sell. I’m not sure the caffeine helps, but by now it’s part of the ritual – and religious types are good at ritual. Interestingly, I sometimes run into the Baptist preacher at the 7-Eleven – like yesterday, for example. Except he’s not heading off to church to work on his sermon. Friday is his day off, and it’s clear from the way he’s dressed that he’s headed to the golf course. He’s got a pastry in one hand and a can of Red Bull in the other. I ask him if his sermon is finished, and he smiles as though it’s the farthest thing from his mind. Hard to believe. But I’m not jealous. I look forward to the hours that lie ahead. It’s one of the most enjoyable things I do. And I’m a terrible golfer. When I finally hit the print button on Saturday morning, I do a fist pump. No one sees me celebrate, but it’s a good feeling. I could just as easily hop in the car and take a victory lap around the block. It’s hard to describe the feeling of satisfaction, the thrill of being able to do this strange and wonderful thing. I get to stand up on Sunday morning (and the occasional Sunday evening) and say the words I think God wants my people to hear. It’s obvious your enjoy doing what you do, because you do it to prefection! I hope life is good on Cape Cog, Barb. Miss you both! Meant “Cape Cod” – speaking of perfection! I enjoyed that look behind the curtain re. how you go about developing your sermons. But it left me wanting a little more…that’s always a good thing when it comes to sermons, right? So I’m wondering – do you do this kind of thing? If so, I bet the congregation would get a kick out of seeing your sermon schematics posted on the walls of Fellowship Hall some Sunday. Are we in luck? Mike, an early lesson I learned about preaching (and writing) is to quit when you’re finished. Better to leave your audience wanting more than having them think about places you could have stopped. I loved the diagram and thought it was further evidence that every preacher develops a unique style. 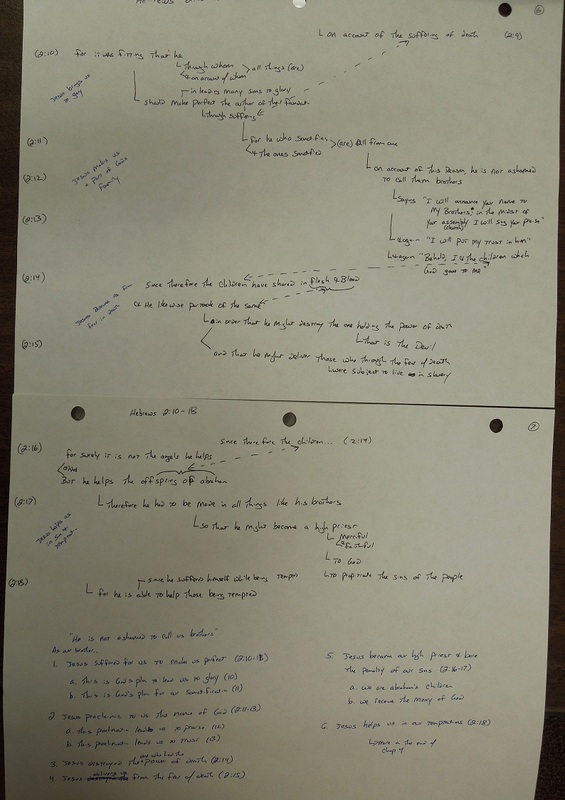 One of my preaching professors used to present “my method,” which was his sermon writing method, and I’m guess most of us tried it – and then discarded it. No one size fits all. I’ve often wondered how the finished product gets to us un Sunday morning—I had to smile at yours, Doug. I even pictured you at every stop along the way! Thanks for giving up some of your ‘secrets!”. and your Friday morning bible study who gives you the direction not to head towards. Yes, it’s hard to imagine preparing a sermon without the helpful commentary I get from the guys on Friday morning!